A shocking whistle-blower account of the biggest state sponsored doping scandal the world has ever seen. 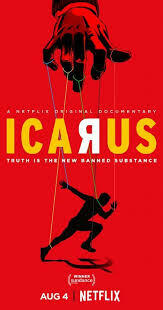 Icarus may be the most surprising political documentary ever made, simply because it was never intended to become what it did. What started out as a film about the suspected faults in the current drug testing protocol ended up blowing the lid off the multi-decades, state sponsored Russian doping program, shaking the entire sports world to its core. In 2014, Bryan Fogel (cyclist and film maker) wanted to see how much better he could do with the help of performance-enhancing drugs when he began training for a return to the grueling 7-day race through the French Alps, called the Haute Route. The first time he rode it clean. This time, he wanted to do it with doping and see if he could still pass, thus slipping through the testing parameters and proving that the existing protocol was deeply flawed. He personally knew many of the riders who themselves had testified against biking legend Lance Armstrong, and had long believed Armstrong to be a cheater. So Fogel contacted the doctor who built the U.S. sports lab on drug testing years earlier, who originally expressed interest in helping on the project but eventually dropped out for fear of damaging his reputation. Instead an introduction was made to the director of the Moscow-based Anti Doping Centre (part of the World Anti-Doping Agency, or WADA), a colorful character named Grigory Rodchenkov. Here’s when things got very interesting. With Grigory’s enthusiastic guidance, and a budding friendship evolving over Skype and their mutual love of dogs, he and Bryan work out a schedule of grueling injections and pills over a 5-month time period, which even includes a visit from Grigory and a Russian urine smuggling plot. Grigory is a larger than life character, so at first you’re not sure what to believe when he makes cryptic comments about having devised a fool-proof system to cheat the anti-cheating protocol of which he himself is in charge. Fogel and his film crew of course follow the clues, all the while working to protect Grigory as much as possible, even though he is at the center of something far bigger than anyone could have predicted. By this time, Icarus has become a full fledged political thriller and nail-biter. When the Justice Dept., the International Olympics Committee, The New York Times and Vladimir Putin enter the picture, the stakes are absolutely life and death. Obviously Bryan Fogel and his producing partner, Dan Cogan didn’t set out to make a documentary within a documentary but that’s what they did. The grand doping experiment leading up to the Haute Route had it’s moments of drama, but nothing can hold a candle to the international scandal, political intrigue and real-life consequences that occurred as Rodchenkow’s involvement deepened, as did the Russian government’s denials. It seems deeply symbolic that Grigory keeps referring to George Orwell’s seminal novel, 1984, reading aloud various passages on truth, free thought, doublespeak and doublethink. Indeed, the novel has reemerged of late; book sales have skyrocketed and there’s even a Broadway production which more than touches on the cognitive dissonance at the heart of much of today’s political discourse, specifically centered on Russia’s actions on the world stage. Is Big Brother Watching? Icarus is presently streaming on Netflix.